For most of its short life Hotel Chocolat has been just a name, a branding exercise to promote a new entry into the British luxury chocolate market. What the company did not have was a real, tangible hotel attached. The location chosen for the hotel was the Rabot estate in St Lucia. Founded in 1745, it was run first with slaves of the French, then slaves of the British. Today it has moved with the times and pays its staff. Other aspects of its heritage, however, are more prominent. On the ceilings above me, tastefully rustic fans are turning; these are of the type that I like to imagine Ernest Hemingway spent much of his life sitting beneath. On the wall behind me is a tastefully rustic decor. Similarly, our tastefully rustic villas are tastefully hidden by cocoa trees and, naturally, the bar opens on to a less rustic — but still tasteful — infinity pool. All this, and the hotel is in a Unesco world heritage site. To use the Unesco terminology, the site nestles between St Lucia’s Pitons. 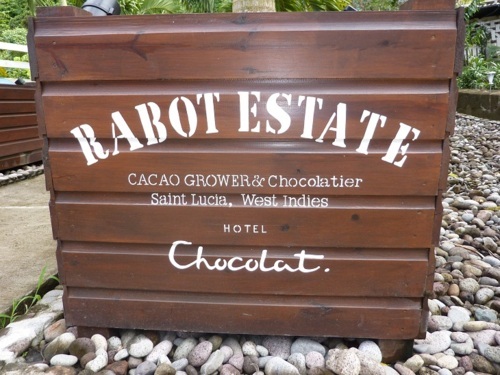 The Rabot estate is in the middle of a land of unparalleled productivity, where the mist rolls in off the sea, feeding the rainforest and the cocoa plantations. But it is no longer cocoa that provides the most money. Rather, this land cultivates that most fecund crop: tourism. This particular tourist, while happy to be seduced by colonial fans, was somewhat alarmed by a chocolate massage — which, frankly, sounds like a distressing euphemism. For post-chocolate eating activities that don’t involve having the stuff physically applied, you can walk off any excess by climbing the Pitons, or terrify yourself on a jungle zip wire. It is, however, impossible to escape the chocolate theme for long, so I joined a trip to find out more about St Lucia’s original cash crop: the one that came before they could make money by planting honeymoon couples in the surf to gaze dreamily at the Pitons. The hotel’s “bean to bar” tour began with chief horticulturist Cuthbert, and a trip to the greenhouses. Cuthbert, who has been here since the estate was bought, likes to educate visitors in extraordinary — arguably unnecessary — biological depth. This includes details of the ancient cocoa varieties that he found when Hotel Chocolat saved Rabot from dereliction. Those who don’t wish to see Cuthbert’s liquid manure can skip to the next stage in the tour — turning Cuthbert’s beans into chocolate. This involves pestles and mortars. The process is less about culinary finesse and more about how bored the Aztecs must have been to ever come up with the idea. After 20 minutes of pounding I have liquid chocolate of sorts, but with a granular consistency. Luckily, finding alternative sources of fine chocolate here is not a problem. In fact, nothing seems to be a problem in St Lucia, especially for its carefully husbanded tourists. So it is that the downside of being close to picturesque mist-fed rainforests is discreetly dealt with by a twice-weekly mosquito apocalypse — caused by a rather less benign type of mist. And while the vertiginous hills frame spectacular sunsets, their more literal downside is taken care of by chauffeured golf-buggies that take guests from villa to beach and back again (with, naturally, five bars of wi-fi signal throughout). Even the sulphur springs, in which I slather myself in hot mud and try to avoid looking at honeymooners slathering each other, are organised for our convenience, the owner describing them as “the Caribbean’s only drive-in volcano”. I wonder who else is competing. If, after all this, the real world is so impertinent as to intrude, it is vigorously batted away as the unwelcome interloper it is. 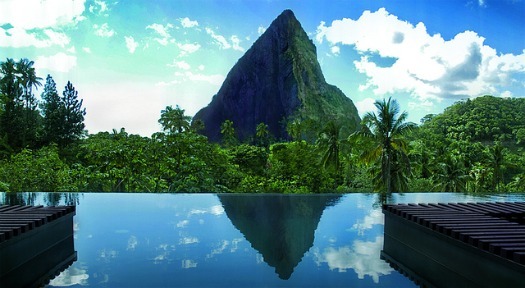 During my visit, staying in a neighbouring hotel to the Hotel Chocolat, there was just such an intrusion: some builders complimented one honeymoon couple on the wife’s reputedly spectacular “Grand Pitons”. The result was a rapid apology, rapid dispatch of champagne to the honeymooners’ villa and, one suspects, the even more rapid dispatch of the builders. Meanwhile in the infinity pool, yet another honeymoon couple arrives to gaze dreamily at the Pitons — of the non-euphemistic kind, and back at the Hotel Chocolat restaurant, another chocolate-based course is delivered. This time, at least, it is dessert. There is crème brûlée (with chocolate), meringues (with chocolate), and chocolate tart (with extra chocolate). This post is being submitted to the My Minorca Villa Competition and in accordance with the competition guidelines has a link to My Minorca Villa to signify entry to the competition.